I don’t break out too often, so when I do I try whatever I can to eliminate the pimples as fast as possible. There was a time just a year or two ago when I randomly started to have hormonal acne, to the point that it even left some scarring. I did a ton of research and the quickest solution I could find was this one homemade mask that was all over the internet. It’s fantastic for fixing uneven skin tones, battling acne, reducing blemishes and restoring a glow to your face! 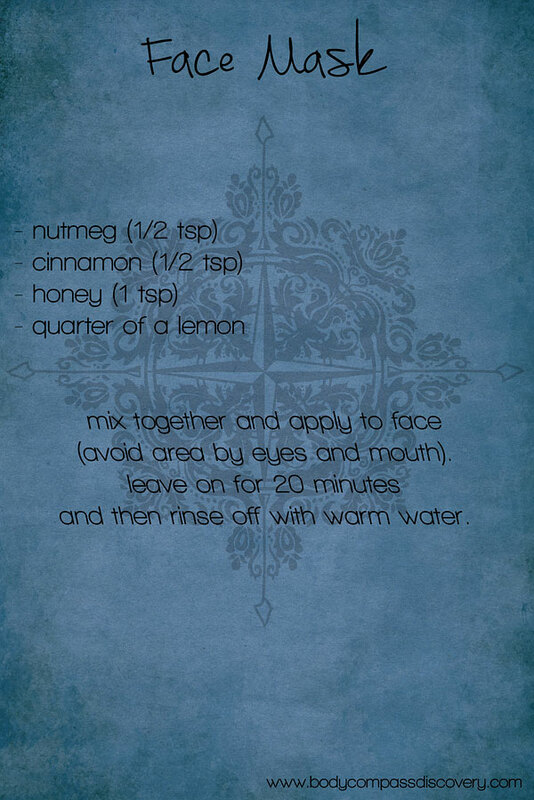 This mask is made up of just four ingredients- honey, lemon, nutmeg and cinnamon. Honey has antibacterial properties to help disinfect, and it also nourishes and moisturizes your skin. Nutmeg and Cinnamon are both powerful anti-inflammatories, plus they are great for exfoliation. Cinnamon helps fight bacteria and nutmeg is rich in vitamins so these two together are extremely beneficial. Lemon is used as a natural toner. Start off with about half of the recommended amount of lemon if you have sensitive skin or if this is your first time to try this mask. It has been called the ‘fire mask’ because the addition of the lemon can result in tingling. However, the lemon is essential in lightening dark spots on the skin. Wash this mask off gently, rather than scrubbing. I suggest using a moisturizer on your face afterwards since it can dry out your skin. There is a reason this mask is so popular- it works. I have used this when I first start to see signs of pimples and I have used this to clear up the marks left behind from an acne episode. It usually always works for me as a prevention and as a mask to repair the skin! Note: It is normal to feel a slight burning sensation while doing this mask. Use less lemon if you have sensitive skin. If you experience a lot of redness afterwards apply some aloe to your skin.